Dusters California makes high-quality longboards and cruisers with a very unique look and feel compared to other brands. Besides creating very functional boards for all types of riding – from cruising and commuting to park and pool to freeride and downhill, Dusters puts a very strong focus on highly polished fit and finish. Dusters also collaborates with different groups when creating their product lines, including very talented and renowned street, graffiti, and contemporary artists. 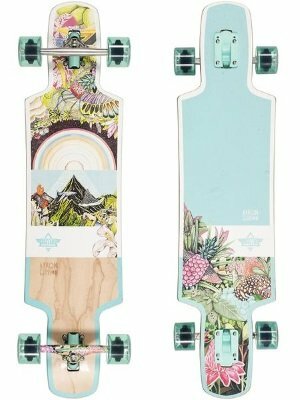 The result is an astounding, colorful, even dreamy range of designs for their longboard collections, a lot of them rooted in the surfing, skating, and rebellious spirit of the 60’s, 70’s and 80’s. In the rest of this article, I take a closeup look at some of the geatest longboards and cruisers in the Dusters California’s lineup. 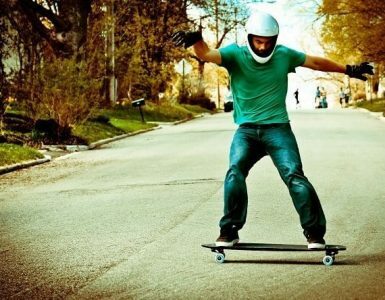 Hopefully the following section will help you better understand the Dusters California products and choose the best-suited cruiser or longboard for you. Dusters California’s cruisers are surf-shaped relatively short boards (25″-33″) designed for nimble cruising at the beach or downtown where space is tight and you need to quickly maneuver around people and obstacles. These are lightweight, portable boards you can easily carry on a backpack and stash under a desk or in a locker. Some cruisers are more street-focused with double kicks, while others are meant primarily for surfing and slashing sidewalks and ride in bowls. This white and pink mini-cruiser is the smallest of Duster’s lineup at 25″ x 7″ with a 12.25″ wheelbase. It has a slashy surfy cruiser shape with good wheel wells. It comes with Tensor 4.25″ trucks and 60mm, 83A duro wheels. This board results from a collaboration with Girl Is Not A 4 Letter Word, an organization founded by Cindy Whitehead, a daring, high-profile professional skateboard and gender activist. The artwork is based on Jim Rugg’s comic book heroine Street Angel. See the GN4LW price on Amazon. The Shaka has a street-oriented cruiser shape with a functional kick and nose for tricks – while still remaining a directional cruiser. It’s 29″ x 8″ with a 12.25″ wheelbase. It comes with 5″ Tensor trucks and 60mm 83A wheels. The black and gold design shows a hand doing the surfers’ shaka sign surrounded with golden palm trees. 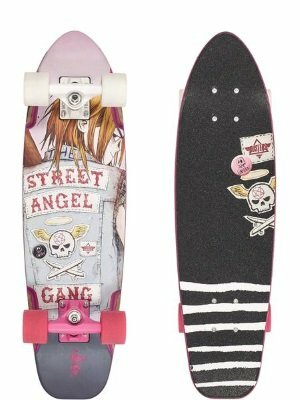 This is a great mini-cruiser for slashing around and doing tricks. See the Shaka’s price on Amazon. 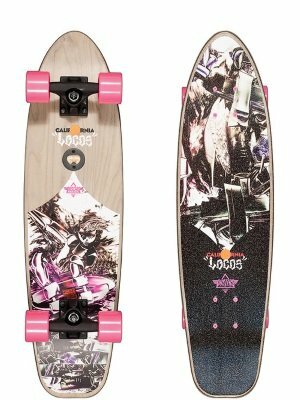 The Flashback is a truly directional mini-cruiser 28″ long and 7.9″ wide with a 14.5″ wheelbase. It has a longer wheelbase than the Shaka, a flat nose, and a diamond-contoured angled kick tail for quick maneuvering on sidewalks. 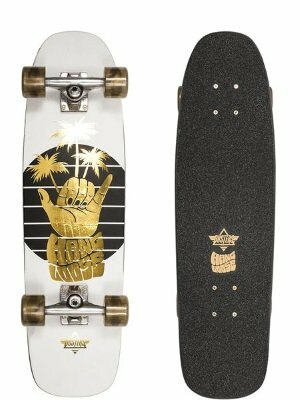 It comes with 4.75″ Tensor trucks and slightly bigger and wider wheels than the Shaka (62mm x 51mm, 83A) for a smoother and grippier ride. The Flashback comes in a beautiful flowery purple design (“Trippycal” version) – or an alternative multicolor “Jiggy” version with graphics also on the front truck. Check out the Flashback’s price on Amazon. The Beach cruiser is 29″ long by 8″ with a 13.25″ wheelbase. It has a big kick for quick turns and curb hopping, and wide square concaved nose for a comfortable wide stance and for some smooth nose kick tricks. The Beach cruiser comes in with 5″ Tensor trucks and 60mm 83A wheels. 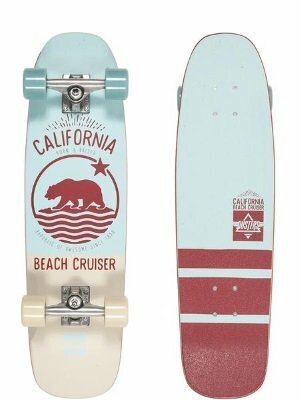 The blue and dark red color and the sober, California-themed art makes this cruiser a cool board to ride around the beach. See its price on Amazon. This cruiser is simply gorgeous with incredible artwork by a member of the “Locos” contemporary art team, Norton Wisdom. The design is a mix of cartoon, colors, shapes, and natural wood, both on the deck’s top and bottom sides. At 29″ by 7.75″ and an impressive 14.75″ wheelbase, it’s a narrower cruiser shape meant for stable and fast cruising in crowded tight spaces. It has a decent kicktail for maneuverability and a flat, pointy nose for good foot space. The Wisdom has a cool built-in bottle opener on the bottom of the deck. The board packs 4.25″ Slant trucks and 59mm by 43mm Dusters wheels, soft enough (78A) for rolling fast and smooth over cracks and bumps. See the Wisdom’s price on Amazon. The Cope 2 has a classic surf shape with a 30″ length, 8.25″ width, and a very long 16.5″ wheelbase for its size. It has a functional squared and slightly uplifted kicktail for those quick turns, and a very small wide rounded nose. The Woodburn graphics theme features rounded hollow shapes in brown color on wood at the bottom, and bright flashy colors on top showing through the clear grip tape. The trucks are wrapped with really cool colored graphics. The Cope 2 runs 5″ Tensor trucks and 60mm wide wheels in 83A providing awesome traction for surfstyle cruising and shredding. One of the wheels is green while the other 3 are white, adding to this Dusters cruiser’s coolness factor. Check out its price on Amazon. The Flashback is 31″ by 8.5″ with a 16.5″ wheelbase. Similar in shape to the Flashback 28″, it’s also a true surf cruiser with a relatively large, diamond-shaped angled kicktail, a wide flat nose for stepping space, and nice deep wheel wells to avoid wheelbite. The Flashback 31″ comes with 5″ Tensor trucks (with 1/4″ risers) and larger and wider 62mm 83A (orange) Dusters wheels for optimal traction when cruising. The deck boasts a “Tonic Orange” graphic theme with a nice wood-colored veneered graphics on top and a mix of blue, orange and yellow colored lines on the bottom. Check out its price on Amazon. The Vibes comes in at 33″ with a 9.375″ width and a 15.25″ wheelbase. It has more of a street-type shape with significant double kicks, although the rounded squared kicktail is wider than the rounded pointier nose. The Vibes has large trapezoid-shaped wheel wells which are green colored. This hybrid type board comes with larger 6″ Tensor trucks but smaller and narrower wheels (60x40mm, 83A) than the more surf-focused cruisers in the lineup – their size is better-suited for street tricks such as ollies and kickflips. The green, black and wood color theme is nice and elegant, and also comes in a red version. See this board on Amazon. The Kosher is 33″ x 9.5″ with a huge 19.25″ wheelbase. It’s a beautiful-looking swallow tail surf shape with a short tail and a rounded nose with virtually no kicks. The Kosher truly mimicks a fishtail surfboard with a very wide and roomy foot platform for super comfortable and stylish cruising along the beach. The Kosher comes with 5.25″ Tensors and big fat 62x51mm Dusters wheels (83A duro) for excellent grip and roll – two of which are yellow. 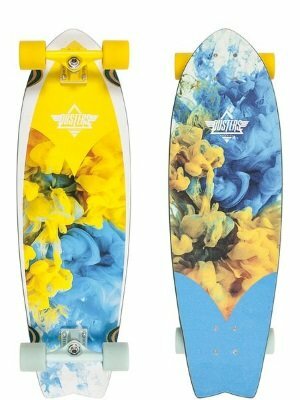 The art is stunning with flowery graphics in blue and yellow shades of color somewhat reminiscent of the ocean deeps, and white contours on the deck bottom. This is by far my personal favorite among Dusters cruisers! Check it out here on Amazon. Dusters California’s pintail line is made of stunning-looking beach cruisers in the 37″ to 44″ long with a classic narrow surf shape for relaxed cruising and easy carving at slow speeds. The Dusters Moto Ranger is a 37″x8.75″ pintail with a 24.5″ wheelbase. 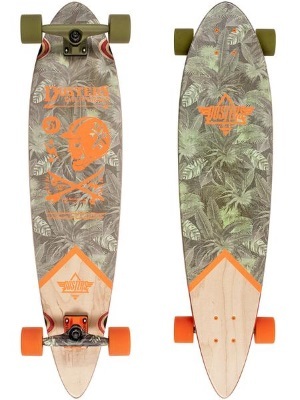 It’s a nice and classic pintail shape for cruising with some very appealing jungle graphic motifs in green and orange color tones. The bigger 65mm soft wheels (78A) make the Ranger a very smooth and grippy ride, while the 6″ Tensor topmount trucks keep the board carvy and responsive. The back truck axle is graphic-wrapped with an orange baseplate and is mounted with orange color wheels. Meanwhile, front truck and front wheels are kaki green. Check out the Moto Ranger on Amazon. Another Dusters pintail, slightly bigger than the Moto Ranger at 39″ x 8.75″ (26.5″ wheelbase) with a jaw-dropping blue and yellow toned artwork by the California Loco artists crew. The Storm come with RKP Slant 150mm trucks with angled riser pads to avoid wheelbite, and70mm 78A green Dusters wheels. See the Storm Pintail pricing here on Amazon. The California Dreaming pintail is 40″ long by 9″ wide offers a smooth and responsive ride with its 150mm Slant RKP trucks and big soft 70mm 78A Duster cruising wheels. It has a surf-inspired artwork with light blue and orange colors, wavey lines and wave and palm tree graphics on top and bottom. 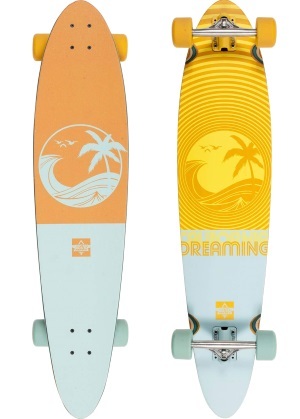 Check out the California Dreaming pintail here on Amazon. 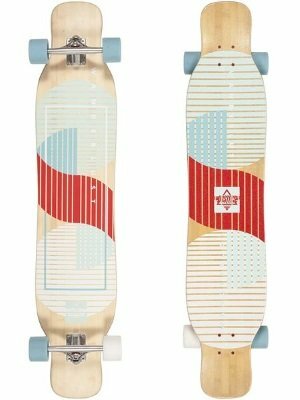 Dusters California’s commuting and freeride longboard range is composed of symmetrical drop-through and double-drop cutout shapes with lots of foot space and big wheels for the best stability and comfort at speed and on longer rides. The Dusters Channel 34″ x 9.125″ is an “almost symmetrical” cutout shape with deep wheel wells providing good clearance for the big 71mm wheels. The drop-through construction and the long 24″ wheelbase result in a very stable ride when cruising and carving at higher speeds. The small kicks add to the deck’s foot space. The Channel is a comfortable board for distance pushing with the deck being closer to the ground than on a topmount. The Black Prism design has an elegant black top with two shades of black for the grip. The bottom layer is a mix of matte black and glossy dark brown, with the black pattern mirroring that of the top side. 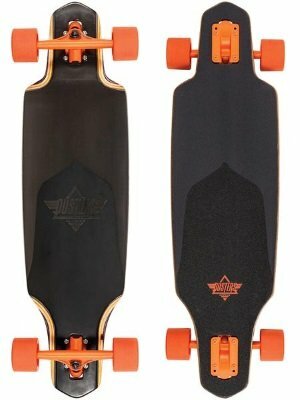 The orange 180mm RKP Slant trucks and orange Dusters wheels bring a flashy color contrast with the dark deck. The soft 78A wheels make for a very smooth and comfortable feel when riding over rougher roads. Check out the price for the Dusters Channel 34″ Black Prism on Amazon. The Dusters Vida is an awesome-looking symmetrical drop-through, 36″ long by 9.5″ wide with a 27″ wheelbase for smooth and stable cruising and freeride. It offers a wide comfortable foot platform and a nice W-concave for secure foot lock-in when going fast. The big grippy 71mm (52mm wide) and soft wheels have plenty of space thanks to the radical cutouts in the shape. The Vida comes with 180mm Slant longboard trucks and wide and soft wheels for traction and shock absorption when riding fast and far. The artwork is beautiful with a pink background and symmetrical geometric flower patterns in purple, yellow and light blue shades on both sides of the deck. Check out the Dusters Vida’s pricing on Amazon. The Dusters Roam is a very roomy symmetrical cutout shape 9.75″ wide with a gigantic 29″ wheelbase (for its length). It has drop-through trucks and a micro-dropped deck, making it super low riding for great stability at speed and comfort for distance push commutes (hence its name). The Roam boasts a medium concave that cuddles your feet and provides a secure lock-in feel at faster downhill speed. It has virtually no kicks resulting in maximum space and comfort for long rides at any speed. The 71mm soft wheels provide comfortable suspension over road bumps, and the RKP Slant trucks offer stability and responsive turns for carving. Loyd Straton’s blue and yellow themed artwork with arrows graphics gives the natural wood some breathing space. The trucks and wheels have mix and matched colors. See the Roam’s price in Amazon. 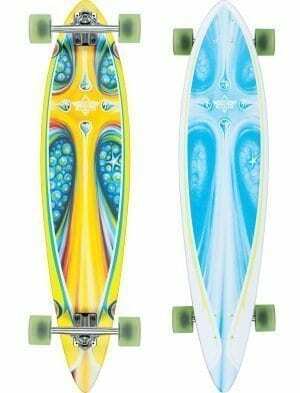 The Dusters Biome is a stunning-looking symmetrical drop-through longboard with very large kicks – together, the kicks amount to half the length of the main standing platform. 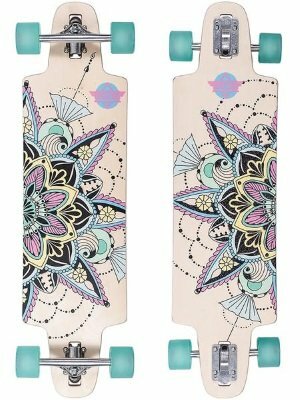 The deck is 9.5″ wide making it very comfortable for the feet when cruising and riding downhill. The nice long 26.125″ wheelbase ensures stability and smooth rides at speed. The custom art by Aaron Glasson is simply amazing, with a teal background on top, teal contour and wood background on the bottom. Both sides have beautiful graphics evoking both mountains and tropical flowers in an explosion of colors. 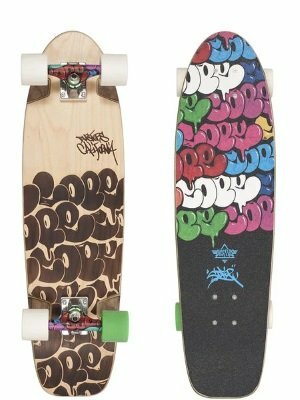 One of the trucks is graphic-wrapped and the 71mm wheels are transparent. The combination of big soft 78A wheels and the stable yet responsive 180mm inverted Slant trucks makes for a very smooth and comfortable feel when carving or freeriding. 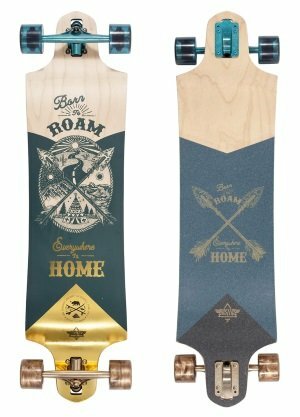 The Biome is a bit pricier than other Dusters longboards but I think it’s worth every cent. See its price on Amazon. 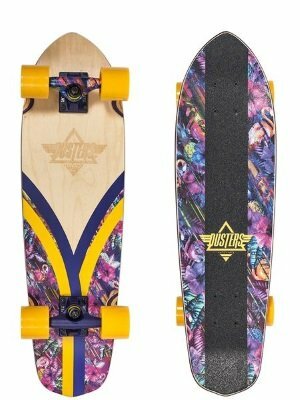 The Wanderlust is Duster’s beautiful dancing and freestyle topmount longboard. It’s a huge deck 47″ long with a 32″ wheelbase, directional in the sense that the kicktail is a bit larger and more upturned than the nose kick. The bamboo construction gives this deck a very nice flex with just the right amount of bounce for carving, while not getting in the way of walking and cross-stepping. The deck has very mellow concave for freedom of movement. The grip is laid out in subtle aesthetic patterns of white, blue and red colors on the natural bamboo background. The board comes with 180mm RKP Slant trucks and 71mm wide, soft and grippy wheels for carving traction when boardwalking or performing classic freestyle fliptricks. See the Wanderlust’s price here on Amazon. 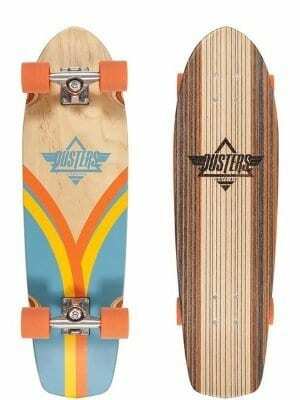 Dusters California offers beautiful quality longboards and cruisers for every riding style and all skill levels, from surf and street style to snowboard style to flexy dancing boards. The stunning colors and graphics created by the Locos crew is unmatched in the world of longboarding.